We’re throwing the spotlight on some of our customers and asking them to let us into their lives and wardrobes. 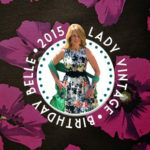 In this blog you’ll discover why Donna Martello loves Lady V and what these dresses mean to her, the memories these dresses bring back, which dress is her favourite, plus hear how people stop her in the street just to comment on her outfit. I have always loved the pinup girl style and look. I would search my local malls and stores, yet I could never find anything. At one point I searched the internet using various terms like "rockabilly dress" and "pinup dress" and luckily I found Lady V London. I went on the site and looked around and was hooked. On the Facebook page I saw a 10% coupon, so I placed my first order of 7 dresses. The dresses were all Hepburn style. When I made my purchase, I knew that I wanted to wear these beautiful dresses every day, whether it&apos;s for work; a night out or even just to do my errands, every day feels like a special occasion. The very first Lady V London dress I wore was the Summer Floral Hepburn which I paired with a crinoline petticoat underneath. Soon after my first order, the two beautiful tea dresses (white butterfly & red rose floral collage) came back in stock so I placed another order and added another Hepburn. Then the May Day coupon came in the email and I added a few more dresses. Then a sale here; a coupon there, now I have such a beautiful collection of dresses. I wear nothing but these dresses. I work for the Gas & Electric Utility in San Diego and this is my work attire. I have paired these dresses with shrugs when it&apos;s a little cooler. I have worn these dresses to the horseraces, plays, concerts, vacations and I wore one of my boyfriend Troy&apos;s favourite dresses, the Red rose floral collage cream tea dress, on our trip to Las Vegas. I’ve even worn two in one day. We once flew from San Diego to Chicago, so I wore the Black & Pink Rose Floral Hepburn on the plane and once we were all checked in to our hotel, I changed to the Orange Poppy on Black Hepburn dress so that we could go to a party. It was hard to pick a single story, as there are so many. My boyfriend Troy and I love watching the CBS television show "Survivor". In December, we were fortunate enough to be able to drive to Los Angeles and attend the season finale of Survivor (a very hard ticket to get). We ended up staying at the same hotel as the contestants and spent the evening prior to the finale hanging out and talking with them. Of course I wore my Glamorous Black Lace Hepburn dress and we took many pictures, including a picture with Natalie Anderson who, the next night, was crowned the "Sole Survivor" and won the $1 Million prize. But when I look at each dress I can visualize a special event or memory. There’s a picture of me and my three daughters and we are toasting champagne and I am in my Red Polka Dot Hepburn dress. I have a picture in the Teal Butterfly Hepburn dress where I went to dinner and met two girlfriends from high school whom I hadn&apos;t seen in more than 30 years. I have picture in the Orange Floral Hepburn dress where we are toasting our beers and then we headed to see my amazing son Tyler who was starring in the play "West Side Story." I always wear my fabulous dresses with my crinoline petticoat. There is something so elegant and beautiful that happens when you wear the dress this way. It makes the dress and the wearer the life of the party. I&apos;ve had people stop me in stores, in restaurants, almost everywhere I go, I get compliments on my dresses. On my trip to Chicago, I went with my boyfriend, our very dear friend Gerry, and his brother Rob. Everywhere we went, people were complimenting me on my dresses, every time I received a compliment, guys would often ask "Hey, what about my shorts?" or "What about my shirt?" I would love to see Lady V offer the Hepburn-style dress with longer sleeves and a variation of collars. I envision a lower scoop neck collar, where a stunning necklace would make the outfit so elegant. It would be great to see more accessories; belts and shrugs. I usually seek out different styles of belts to wear with my dresses and at different times of the year I pair my dresses with a lightweight shrug. I love to pair the dresses with beautiful shoes from Poetic Licence and Ruby Shoos. Maybe Lady V London could do make a collaboration with Ruby Shoos and if you buy a pair of shoes, you get a coupon at Lady V London or vice versa. I would love to see Lady V London offer a few more cocktail/formal dresses. Recently I had the opportunity to attend the Grammy awards in Los Angeles and needed a cocktail/formal dress. I would love to see a few dresses maybe with some tulle to make an ordinary woman feel extraordinary. Victoria, thanks for such a lovely article. I shared this on my FB timeline and got so many wonderful comments. Never wore a dress in high school making up for it now with your beautiful dresses! This fabulous, just entirely fabulous. My husband, if he were not in love with me, would surely be in love with you. ;) He loves women who love to be feminine.